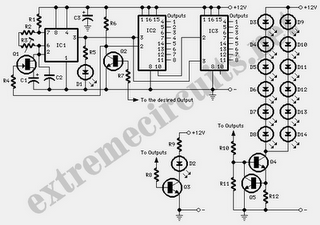 This circuit, designed on request, allows up to 15 LED clusters to illuminate in bar-mode sequence. LED sequencing will start at power-on and, after reaching the desired output, all the LEDs turn off and sequence restarts. The number of LEDs or clusters forming the bar can be selected by connecting R7 to the appropriate output pin of IC2 or IC3. R5 and D1 are optional: they could be of some utility in monitoring the sequence frequency set by means of R3. The terminal of R7 bearing an arrow must be connected to the desired output pin of IC2 or IC3 in order to select the number of LEDs or clusters forming the bar. For example: if you want to drive seven LEDs or clusters connect R7 to pin#11 of IC2 (Output 8) and the LED or cluster drivers to Outputs 1 to 7 respectively. Clusters can be formed by up to 12 LEDs as shown in the circuit diagram, right side. Common cluster types usually range from 5 to 10 LEDs. Up to 15 of these cluster driver circuits, each formed by the LEDs, two transistors and three resistors can be built and connected to the progressively numbered outputs of IC2 (the first eight clusters) and IC3 (the remaining clusters). If a number of clusters up to 7 is required, IC3 can be omitted. Constant output current value for the LEDs can be changed by varying R10. The formula is: R = 0.6/I (I expressed in Amperes). Wanting to drive only one LED per output instead of a cluster, the above mentioned cluster driver can be substituted by a single transistor, as shown in the circuit formed by D2, Q3, R8 and R9.